SHF- and CNC-derived VSMCs intermingle in the aortic root of Tbr1MR/+ mice. (A) Schematic representation of the aortic root and arch highlighting the embryonic origin of VSMCs that populate the medial layer in these regions. (B) Schematic representation of mouse transgenic lines used for tracing of SHF- and CNC-derived VSMCs. Mice carrying a conditional STOP cassette controlling expression of a fluorescent reporter were crossed to mice that express the Cre recombinase under the control of the SHF-specific promoter Mef2cSHF or CNC-specific promoter Wnt1. Removal of the STOP cassette induces expression of the fluorescent reporter and allows identification of VSMCs derived from the lineage of interest even after these promoters are silenced postnatally. (C) Representative fluorescence images of the aorta of control (Tbr1+/+) and mutant (Tbr1MR/+) mice in which SHF- and CNC-derived cells are lineage-traced based on TdTomato fluorescence; insets mark the areas in the ascending aorta and aortic root shown at higher magnification to the right of each panel. 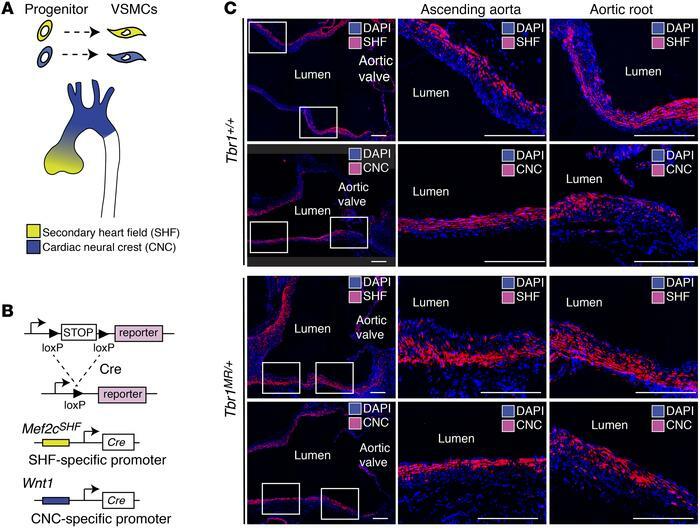 SHF- and CNC-derived VSMCs intermingle in the aortic root, with relative polarization towards the adventitial and luminal margins of the media, respectively. Scale bars: 200 μm. Image enhancement for visual display was applied uniformly to all panels. Experiment was conducted at least 3 times.